I've often wondered how useful the numerous instructional miniature model painting videos out there really are. I was recently given the chance to review one of the videos from the Miniature Mentor, and that's what I'm here to talk about today. The video I was able to review is called The Complete Guide to Miniature Painting. It's a 4 hour video featuring Golden Demon winning painter Laurent Exposito Mas painting up a Rackham Wolfen model from start to finish. I was given access to the download-able version of this video. It's simply a .zip file with about 14 smaller video files all clumped together within it. All of these files have to be viewed separately. It's about a 1.84GB file, so it's very close to a 2 Gigabyte download overall too. There is a small text file in the .zip file telling you what order to watch the video files in called Video_Order. The sections detailed are as follows...Intro, Priming, Cloth, Hair, Flesh, Eyes, Mouth, Sword, Leather, Claw, Bow, Trap, Bomb. In that order the model is prepared, primed and painted from start to finish. Now the video and audio quality really surprised me, as it is quite nice. I was able every step of the way to see and hear what the guy was doing very clearly. While the main guy doing all of the painting sounded like he had a foreign (French I'm assuming) accent, I was still able to understand him quite well. To back him up the guy filming in the background also adds a lot of dialog throughout the video, sometimes repeating what Mr Mas had to say. So even if you do have a hard time understanding him, the camera-man backs him up and adds info throughout as well. At the standard video size in a window it all looks very sharp and crisp too, so it's not hard at all to see what the guy is doing, and the gradual effects his techniques have on the painting process. Quite frankly, Mr Mas makes it all look wicked easy every step of the way. 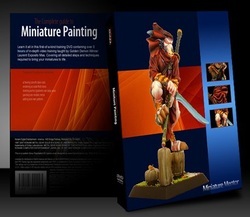 I was pleasantly surprised by The Complete Guide to Miniature Painting. The production quality is really quite high, and I think it can be utilized as a useful tool for a budding painting enthusiast. I learned some things, and I've been at this for ages, although I'm still no Golden Demon-quality painter. A few things he does did surprise me. For instance, he really doesn't prime his models all the way. He puts down a quick burst of paint, leaving a lot of metal showing. However he does clean the model a little more extensively than I ever have, by using some super fine sandpaper at the end, almost buffing the model to a fine shine before priming. This method in theory sounds like it would leave a surface appropriate for paint to adhere to, more than my method of filling away mold lines and imperfections, and then laying down primer to completely cover the model. If anything this guy saves a lot of money on primer too. I also liked the explanations given in the video comparing black primer to white primer, with pros and cons on both in great detail. His technique is also by no means the only technique, nor is it the #1 proper way to paint. Many Golden Demon painters, and many hobby enthusiasts in general employ the techniques that they feel work the best. I don't think there's a single best method, but his methods are pretty darn impressive for sure when you see the finished product. This guy lays down extremely thin layers of paint every step of the way. His base-coats alone are many thin layers, where as I'll usually put down no more than two layers for a basecoat. So the techniques showcased in this video are time consuming to employ, but this guy does prove that they work quite well, and it's very clear that he's damn good at painting. I also found the little pop-up Tips that surface during the video to be helpful, because you'll be watching the video and then all of a sudden super imposed over the screen will be the wording "Tip", then text superimposed underneath with a helpful tip appears. I've definitely learned a lot of things, and this video has given me some new ideas and techniques to employ when laying a brush to metal next time I sit down to paint. The problem is that it's really hard to put a price on a video like this, because I've seen some of the other options that are out there for free. While even the freebies on YouTube aren't as high quality, or as detailed as what I've seen from this Miniature Mentor production, they're still free nonetheless. My primary gripe with this product is that the downloaded version is nothing more than a .zip file with a bunch of video files inside. If they want to charge what they do for the download version, they should at least take enough pride in their work to edit all of the video files together into a single video file production. While the video and audio is really nice, they don't get high marks for initial presentation when you have to bounce back and forth, and read a text file to tell you what order to watch the files in. It cheapens the entire experience if you ask me. The version as reviewed is the downloaded version, and it carries a price-tag of $30 USD. They also offer it on 2 DVDs in a set for $50 USD, which honestly is far too much. At $50 that better come on Blu-Ray, but it doesn't. Even the $30 USD price-tag for the version to watch on your PC is a bit much if you ask me, but it can be a valuable tool for a miniature painting enthusiast looking to learn how an expert paints models. This video is only the tip of the iceberg, as there's many other videos available by many other well known painters like Jennifer Haley for instance. This video covers a little bit of everything, but it doesn't go into great detail with techniques like Non Metalic Metal (NMM). There's separate videos available covering NMM, painting Black Cloth, White Cloth and Realistic Skin Tones in another package for an additional $20 USD to download. I counted about 16 videos in all available at their website. In addition Miniature Mentor also offer video tutorials on the topic of miniature sculpting with the likes of James Van Shaik showing you the ropes. They also offer a subscription rate, which is an insanely outrageous $70 for the first month, and $8 each additional month, which would give you access to all of their files. The bottom line is, there's definitely a lot of useful information to be found within the videos they have to offer. If all of the videos are of the same production quality as the one I've seen first-hand, then they should all be quite impressive productions. The only hard part is putting a price tag on what you think that information is worth to you. If you feel $30 for a video you have to watch on your PC is worth it, then you might want to check out the Complete Guide to Miniature Painting video.